Why reduce the amount of Omega 6 Fatty Acids in your diet? Omega 6 Fats also called Omega 6 Fatty acids is a crucial FAT that the human body cannot make. These are essential fats and a type of polyunsaturated fatty acids (PUFA) we have to get them from food sources. Both Omega 6 and Omega 3 are key for the human body. What is the amount of Omega 6 Fatty Acids you should have? Most of the World diet is based on high usage of Omega 6 fatty acids over Omega 3. Studies show that there is 20 to 25 times more consumption of Omega 6 over Omega 3 in our diet which is not good for the body. The ideal ratio is said to be 2:1, that is two parts Omega 6 to one part Omega 3 or some argue for a ratio of 1:1. Most Omega 6 fatty acids promote inflammation and come from vegetable oils in the form of Linoleic Acid (LA). Foods rich in Linoleic Acid promote inflammation in the body which is not good for you and is the root cause of many diseases. 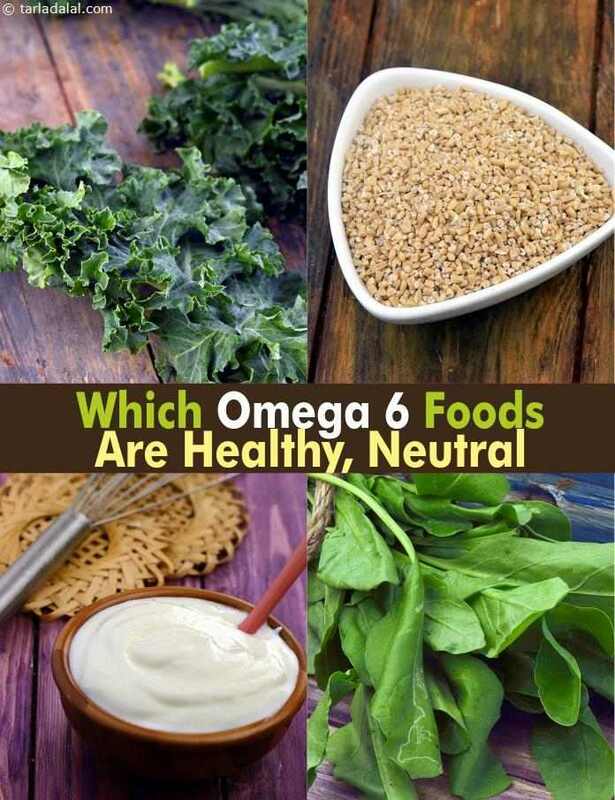 But there is Gamma linolenic acid (GLA) , a healthy omega-6 fatty acid which is will reduce body inflammation and we should try and consume more of this type of omega-6 fatty acid. Gamma Linolenic Acid (GLA) comes from plant foods like Spirulina , Black Currant oil, Hemp oil and evening Primrose Oil. Oatmeal also provides GLA and use the Steel Cut Oats which take more time to cook but do the job of GLA if had several times a week. GLA rich foods may reduce body inflammation. Spirulina Powder and Steel cut oats are easily available in India. Inflammation in the body also comes from air pollution, smoking, metals present in foods and lipid peroxidation products (they damage cell membranes in your body) like roasted nuts and vegetable oils. The Brains is just FATS. How do these lipids and fats get there? It is influenced by the types of oils and fats you choose to eat. They help your concentration, emotions and cheer by having the right ratio of Omega 6 to Omega 3 foods. Violence, rage, anger, moodiness in humans is related to Omega 3 deficiency. The lower the % of Omega 6, the better for you. So in the above table you would definitely use coconut oil and avoid oils with high Omega 6 content like Corn Oil and Safflower Oil. Pick a spot on your body and there will be cells responding there under the influence of Omega 3 and Omega 6 balance. Omega 3 is a nutrient for all organs in your body and apply to everyone. Its good for brains, eyes, skin, heart, lung, gut and on. 75% of chronic diseases can be prevented by eating correct. Do the HUFA blood tests for ratio of Omega 6 to Omega 3. Highly Unsaturated Fatty Acids (HUFA) are the long chain fatty acids of Omega 3 and Omega 6 which are essential for health. Given below are recipes which are healthy and neutral in Omega 6 and Omega 3 fatty acids which is the best combination for healthy living. Articles you may find interesting.